Over the years I’ve consulted with many clients through my consulting business who know that they should stock up on food, water, and other needed gear but they’ve become so overwhelmed with all the “prepper foods” and “prepper gear” suggestions that are being promoted on nearly every survival blog and prepper website that they don’t know where to start – so they contact me for help. I love seeing the look on their faces when I tell them that they don’t really need all of that stuff or need to order anything online because everything needed to prepare for a local disaster or even a total SHTF event can be found and purchased at their local Wal-Mart. Prepping should be a simple and low-cost expenditure, unfortunately prepping has been made into a business where you’re intentionally led to think that you have to spend thousands of dollars on long-term storage foods, firearms, bug out vehicles and other related gear, when in reality everything that you really need can be purchased quickly and cheaply at your local Wal-Mart Supercenter. 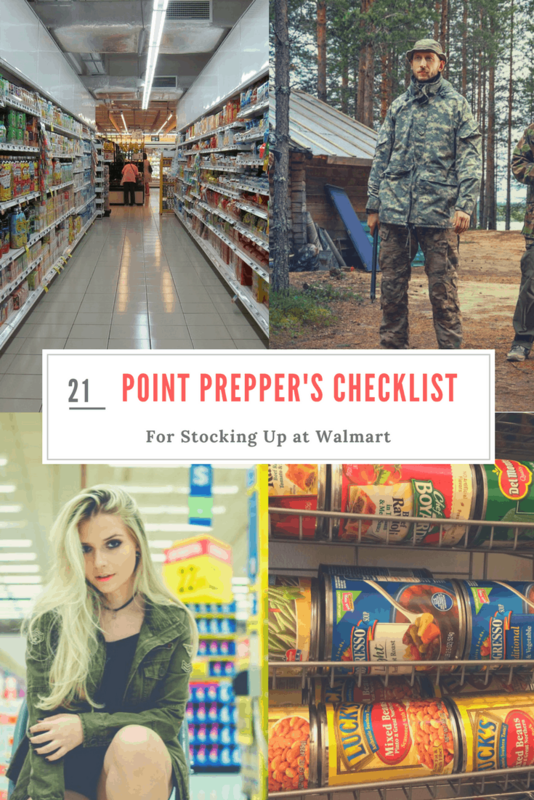 Below I’ve put together a 20 step prepper’s checklist that once completed will make you better prepared than probably 95% of the U.S. population – all at a fraction of the price of purchasing an equal amount of foods and gear from the prepper supply vendors that you see promoting their products everywhere online nowadays. You can do all 20 steps at once if you want or you can divide each step into separate days, weeks or months. But you need to get it done as soon as possible. Keep in mind that this is only a starting point and isn’t presented here as a completed end-all list. Prepping is a lifestyle and you’ll always be working on and improving your skills and adding to and or altering your supplies. 1. Head to the nearest Wal-Mart and pick-up 20 lbs. of white or brown rice (white rice stores longer but brown rice is more nutritious) and 20 lbs. of pinto beans. White rice has a better storage life while brown rice has more nutritional benefits – your choice. 2. While you’re there grab 5 lbs. mixed beans, 5 lbs. of white sugar, 5 lbs. of iodized salt, one gallon of olive oil (can be frozen to extend shelf-life), 5 lbs. oats, 10 lbs. each of white or wheat flour and cornmeal. 3. Now head over to the canned foods and pick-up 20 cans of canned fruits and 20 cans of canned vegetables. Be sure to buy only those brands and contents you normally eat and nothing exotic. No need to shock the senses. 4. Now over to the canned meats. Pick-up 20 cans of various meats, salmon, stews, spam, and tuna. Again buy only those brands with contents you normally eat and nothing exotic. 5. Okay. Now to the to the peanut butter shelf and toss two 40-ounce jars in the cart. The listed shelf life is just over two years and each jar has over 6,000 calories. Peanut butter is an excellent instant survival food. 6. Over to the powdered drink mix – go on I’ll wait…Okay, pick up two 72 Ounce Tang Orange drink canisters (provides 100% of the US RDA vitamin C requirement per 8 oz. glass). Also, grab six 19-Ounce Containers of Kool-Aid Drink Mix. 7. Off to the vitamin and supplement aisle, pick up 400 tablets “one a day” multivitamin and mineral supplements. I buy this brand at the local Wal-Mart – comes in 200 count bottle for $8 each. 8. Now to the department, we all love – sporting goods. Go to the camping aisle and pick up 4 five gallon water containers. Fill with tap water as soon as you get back home. 9. While you’re there buy 250 rounds of ammunition for your primary defensive weapon. More if you can, but this will be a good start. Also a good universal cleaning kit. 10. And while you’re in the sporting good department pick up the best flashlight you can afford, extra batteries and bulb. Also, grab two boxes of wooden matches and several multi-purpose lighters. Don’t forget to date, use and rotate – remember first in first out. Let’s get started. What would you add to the list? 11. Go to back the grocery department and pick up 5 lbs of powdered milk or the equivalent of canned, now go over to the next aisles and throw in 5 lbs of rolled oats and a case of Ramen noodles. Ramen noodles aren’t the most nutritional food but they are cheap, add bulk to the diet and store well – just don’t rely on them to provide all your nutritional needs. And don’t forget a good manual can opener. 12. While you’re in the grocery department be sure to pick up an assortment of spices to taste, such as Basil, Chili powder, Cinnamon, Garlic, Sage, Marjoram, Oregano, Rosemary, Thyme and Black Pepper. Spices can go along way toward making unfamiliar foods palatable. Also, while you’re in that area add 5 or more lbs of salt to your shopping cart, as you know salt has 101 uses. 13. Okay, counting what you bought during our first trip to the shopping center, that should do it for the grocery. Now go over to the area near the pharmacy and pick up 3 large tubes of toothpaste, 3 brushes, 100 double edge razor blades, (note: if you don’t have a razor you’ll probably have to order one from Amazon.com and don’t forget a brush and bowl), I’ve used this type razor for years and think it is a cheaper long-term solution than disposable. 14. While you’re there, add the most comprehensive first-aid kit that you can find to your cart and don’t forget over the counter pain meds (Tylenol, aspirin etc.). If you’re a woman (or have one in your life) go over a few shelves and pick up enough “feminine” supplies to last three months or longer. 15. With all that food in your pantry its only a matter of time before you have to poop. I know, its shocking but we all do it. If you have a water source such as a stream or lake nearby you can still use the toilet in your bathroom, all you have to do is manually fill the tank in back and flush as usual. If this isn’t an option, you’ll need to look for other alternatives such as the Portable Toilets sold in the sporting goods department or making a sawdust toilet from a five-gallon bucket. 16. What’s next? You guessed it toilet paper. If you poop you need to wipe, if not you probably need to start. You could use a corncob, cloth, Roman sponge on a stick or paper from discarded books or newspapers but I would wager most of you prefer the softness of Angel Soft. Get enough to last at least a month, more if possible and remember women need more than men so plan accordingly. 17. While you are in that area of the store pick up a supply of disposable plates, bowls and plastic utensils. Don’t go overboard here but having a small stockpile of these items on hand can save a lot of water that would otherwise be used to wash dishes. Also add two or more gallons of regular, unscented bleach to your cart. 18. This is a biggie and can’t be done (legally) at the department store pharmacy without the signature of a doctor – that is stocking up on prescription meds. Getting more than a 30 day supply, at least in the U.S., can be difficult if not impossible. But there are ways to get most of what you need for long-term survival. See this book (note: some of the information in the book is dated but there is still good advice to be found). 19. Now push your cart (man this thing is getting heavy) over to the hardware department of the store and pick up a carpenters hammer, vise grips, adjustable wrench, screwdriver set, duct tape, electrical tape, ax, pry bar, crosscut saw, hacksaw and a large can of WD-40. This is your bare minimum survival toolkit. 20. After you get your toolkit, go over to sporting goods and in the camping supply aisle pick up a propane camp stove and 5 or more 1 pound propane cylinders or a bulk 20 lb tank and hose adaptor – yes the pressure in the small bottles is the same as a 20 lb cylinder or even 100 lb tank, just be sure to get the proper adapter and hose assembly. Another alternative and the one I prefer is the Volcano Stove because I can use propane, wood, and charcoal. 21. Okay, we are just about done – only a few more steps you’ll be out the door and heading home. You’ll need a way to keep in touch with your group so go to the electronics department and pick up the best two-way radios that you can afford – I have these. Don’t forget a battery-powered radio and extra batteries for both. While not necessary, I prefer a radio capable of receiving AM/FM and shortwave broadcasts – I have this one. What did I leave out? What would you add? Let us know in the comments below. I’ve practiced this approach for stocking up since 2010. Hardest part is to get the non-prepper wife to go along. For large quantity (40 – 50# bags) of sugar, rice and some beans, I’ll go to Costco. Sams doesn’t have the variety I prefer. I have also purchased and stored flour from Costco. It’s All Purpose and you have to add baking powder and salt to get “self rising”. Producing really good biscuits. I’ve ordered beans in 50# bags from the feed and seed before. That worked really well, just be sure to tell them you intend to eat the seed so please no fungicides and hopefully cleaned of miscellaneous trash. I also keep at least one 5 gallon bucket with 5# bags of grits and corn meal. Place a large oxygen scavenger in the bottom of the bucket to keep it fresh and bug free. When I buy spices from Costco, I’ll set up another bucket with oxygen scavenger and pack it full of spices, salt, baking powder, baking soda etc. Whatever I don’t buy in the stores already canned, I’ll put it in 5 gallon cans. Lowes has the food grade cans and covers. Order your oxygen scavengers from Emergency Essentials or Amazon. Our garden is small, only 60 ft by 90 ft, but it does produce. I water it using a well system. My weak spot is pumping water. I want to expend some funds to purchase a double action wind mill pump that I can move water from the well to the other end of the property. But, I do not see the need to purchase all of the freeze dried food as long as I can process vegetables from the garden. It’s a good start and reminds me to get more propane. I would add heavy duty aluminum foil, charcoal briquets , and kitty litter for a toilet alternative. MD – – I know Hell-Mart does not stock solar battery chargers. While an unopened pack of batteries may last three years on the shelf, putting them in vacuum sealed bags in your freezer extends the life indefinitely. However those crank handles break and the cheap plastic gears wear out leaving you with no way to charge the radio, and thus no comms, unless you have a solar powered battery charger. Some “survival” radios come with a solar charger built in but I would not put too much faith in the longevity of such devices. They are great when they work, but you will still need a solar chargers a back up. One of the best solar battery setups that I have is SunJack 20W Portable Solar Charger and a USB Battery Charger for Rechargeable AA/AAA Ni-Mh and Ni-Cd Batteries. We have hit a road block. No longer are able to prepare legumes in a manner we can eat. We like them well enough. but hope and pray we never need to eat more than a ppound every 2 months. Other intolerances for medical reasons abound…including most of green things, .Re working lists/ stored items to reflect on new intolerances and dietary needs is a challenge in it’s self… Root crops will be our focus this year and adding meat sources.. I can so relate, as I recently discovered its nightshades (tomatoes, cayenne, etc.) that I’m allergic too! I now tolerate garlic, raw broccoli and raw carrots, but that was after spending hundreds of dollars on probiotics and vitamin tablets and cutting nightshades out of my diet. Best wishes on your health and on prepping! What exactly, do I need to buy in order to charge a PC using Solar? The 20W solor charger I do have, does not allow a PC to be plugged into it. It takes USB cords. Thanks! Not sure what the wattage is on your radio that you recommended, but I’ve chosen the Baofeng BF-F9 V2+ HP 8Watt Tri-Power (1/4/8w) w/ 3800mah for my radio. I want the higher power range in case of an emergency. I also use the4 BF UV-5RA radio with a mx of 4 watts and a GMRS license to use all available frequencies. Want to remind everyone that Ramen Noodles are cheap, but as you stated, not much nutrition. But you can add canned meats and vegetables…look thru your pantry and you will come up with your own ideas. My favorite is chop up tomatoes and banana peppers and sprinkle with cheese. The flavor packs are full of salt, but either use your own spices or use half the pack. I store the packs……might come in handy to use on other foods and on camping trips. Stock up and get in your daily workout all at the same time. Loved the quote. Our track coach said it so often we all had it memorized. His version: “There on the plains of hesitation lie the bleached bones of countless millions who, with victory in sight, stopped to rest and there resting, died.” Graduated in 1966 and still remember that! Rest of the article was good too. I could not do this all or once or want to if I had the $$$ to do it. I would do it in several days or stages so I do not overload my truck. Or at leas in stages such as Saturday morning then latish Saturday nigh so people do not notice a pattern. If someone tells me that is a bunch of stuff I would say that is what my wife put on the list. That would normally get anyone to scam. Previous story What’s The Difference Between Hybrid and Non-Hybrid Seeds?